LATEST UPDATE dated 1504.2019 : Good News !! Admit Cards for UPSEE 2019 Entrance Exam are available Now from 15 April, 2019. Candidates can Download UPSEE Call Letter 2019 from link given below…. 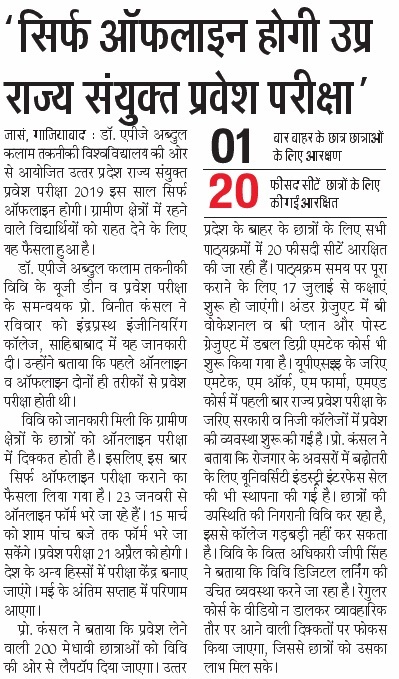 UP State Entrance Exam (UPSEE 2019) will conduct in only Offline Mode this Year. This decision is taken for Candidates of Rural Areas. Read full news from image below…. AKTU Formerly Known as UPTU, Every Year conducts UP State Entrance Examination (UPSEE 2019) For Admission to First Year of B. Tech./ B.Tech. (Biotechnology)/ B.Tech. (Agriculture Engg. )/ B.Des./ B.Arch./ B.Pharm./ BHMCT/ BFAD/ BFA/ MBA/ MBA(Integrated) / MCA/ MCA (Integrated) and 2nd Year (Lateral Entry) of B. Tech/ B.Pharm./ MCA Courses. The entrance examination for degree level engineering institutions and other professional colleges has been assigned to Dr A.P.J. Abdul Kalam Technical University Uttar Pradesh, Lucknow. UPSEE-2019 is being conducted for admission to all the Technical Institutions / Colleges affiliated to the AKTU, Lucknow. Admissions in some of the courses in the other Universities of U.P. are also done through UPSEE-2018. 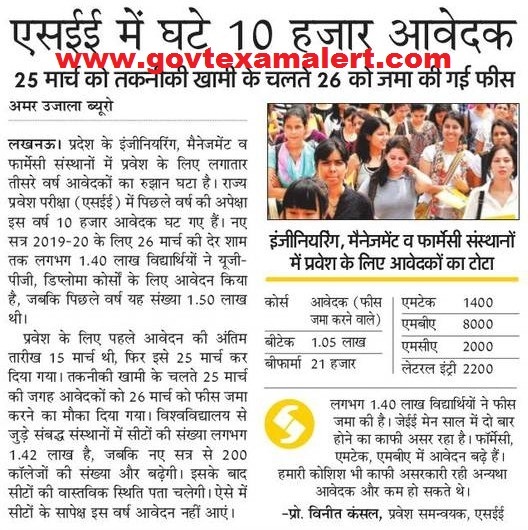 Candidates who has applied for UPSEE 2019 Exam, must be looking for Admit Card & Exam Date/ Schedule for UP State Entrance Exam 2019. Candidates can get all important information, updates of UPSEE Admit Card 2019. Admit card will be available online on the website http://www.upsee.nic.in to every candidate. Downloaded admit card shall be treated as valid admit card. The candidates are advised to check the details of admit cards with regards to their category, sub-category, gender, rural weightage, Name, Father’s Name etc. as mentioned on the Admit Card. No candidate will be allowed to appear in the examination without admit card. If any candidate is unable to download his/her admit card, he/she should contact the helpline as indicated on the website http://www.upsee.nic.in or send an email to the mail address upsee2019helpdesk@aktu.ac.in latest by 20th April, 2019. 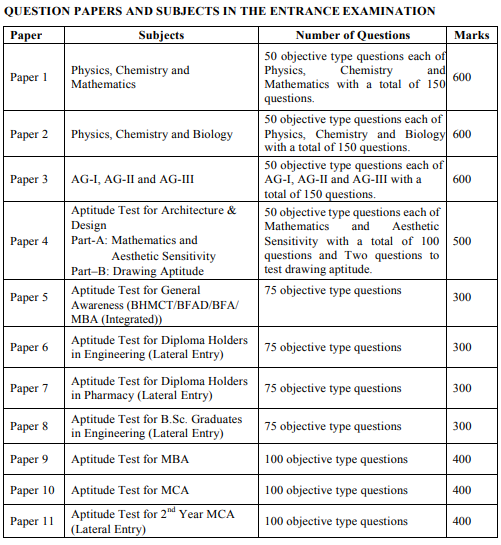 UPSEE Exam Pattern 2019 : UPSEE-2019 will be conducted for eleven papers with objective multiple type questions except Drawing Aptitude test (Part B of paper 4). The candidates are required to opt papers and subjects for appearing in the entrance examination, subject to their eligibility. Paper 1, Paper 2, Paper 3 and Paper 4 shall be OMR based Test only. Paper 5, Paper 6, Paper 7, Paper 8, Paper 9, Paper 10 and Paper 11 will be Computer Based Test only. All objective type questions are required to be answered on a specially designed OMR answer sheet against the respective question number. Candidate is supposed to select only one choice for correct answer in each question. Every objective multiple type question would carry four marks for each correct answer. More than one answers indicated against the question will be deemed as incorrect answer and no marks are awarded for the incorrect answer. There will be no negative marking. However, a record of incorrect answers given by a candidate will be kept separately. Answers in OMR based examination (Paper 1, Paper 2, paper 3 and Paper 4) are to be marked using ballpoint pen (Black / Blue) only. For the purpose of evaluation in these papers, the details filled in by the candidate in the OMR answer sheet will be treated as final. NOTE : All information in connection with UPSEE-2019 shall be made through University Website http://www.upsee.nic.in or https://aktu.ac.in. The candidates are advised to refer to this website regularly/frequently failing which AKTU will not be responsible for any loss due to the lack of communication.